The Uniden Bearcat 180XLT and 280XLT are almost identical recent scanners. The modification with an additional chassis socket has been on this site for a long time. But it can be done without drilling: the earphone socket can be modified. Next to the standard earphone signal, the unfiltered audio becomes available. 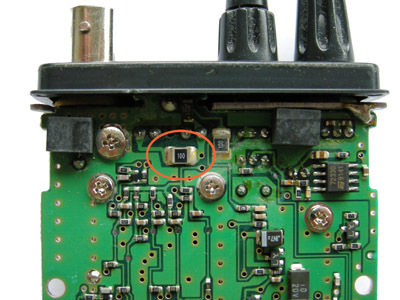 The discriminator IC, an SMD MC3361, is located at the back of the PCB that becomes visible if you open the scanner. 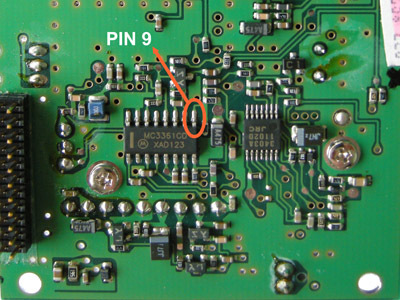 Pin 9 of the MC3361 carries the unfiltered demodulated audio signal.A piece of insulated wire is connected to pin 9. 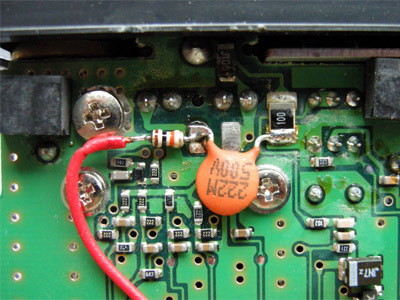 The usual 10 k limiting resistor is soldered at a different place, close to the 3.5 mm socket. 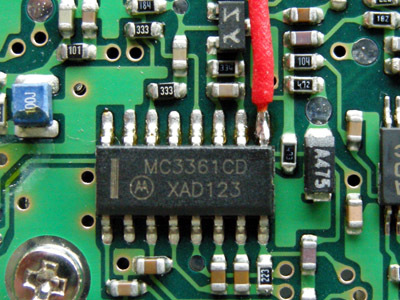 The resistor's other lead is connected to the wire coming from pin 9 of the MC3361.